Andy Murray led the Blues to a 25-9-7 record in the second half of last season. 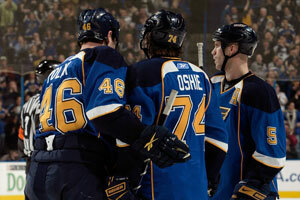 With a taste of the success, the Blues are hoping to repeat it during the 2009-10 season. (Getty Images). There were more than a few moments frozen in time for the St. Louis Blues during their NHL-best second-half record of 25-9-7 that led to their first playoff berth since 2004. But you won't hear coach Andy Murray talking about riding the wave of that emotional stretch run or any kind of carryover from last season. "I don't believe in momentum," Murray said. "You don't play well in the next game or next season because of something in the past. It's all about hard work -- and playing in the moment." But, believing in "Old Mo" or not, the Blues' performance down the stretch from last place in the Western Conference late in the third period of a Jan. 19 matinee in Boston -- when the Bruins were first overall in the East -- was fun to watch. "The coach is right when he talks down the theory of momentum. No one gives you anything in this League. You have to be ready and on your toes every night," David Backes said after batting a puck out of mid-air to tie the contest in Boston with .8 seconds remaining and T.J. Oshie won it 4-3 in a shootout. "Still, I'm convinced we all felt a confidence in that win in Boston that helped bring us together." Added goaltender Chris Mason, "It's a battle out there every night and, whether it was the energy of the kids or the experience of the veterans, veterans and kids alike learned that you only get what you work for and how important it is to stand up with the guys next to you and fight to win every battle." For this season, the Blues expect Mason to continue make a series of saves in nearly every game as he did in the final 33 games last season, as he posted an impressive 24-8-6 record down the stretch with five shutouts, a .924 save percentage and a 2.08 goals-against average. It's no secret that management expects the tandem of Mason and Ty Conklin, the Blues' only real free-agent acquisition, to keep St. Louis in every game. Conklin had a 25-11-2 record with Detroit last season. What makes last year's electric run a potential precursor of even better things is that the Blues accomplished it without Erik Johnson, their most talented defenseman who was out for the season following a pre-training camp knee injury, Paul Kariya, a seven-time All-Star who saw his season cut to just 11 games before having surgery on both hips, plus captain/defenseman Eric Brewer, whose surgically repaired back ended his season Dec. 11 after just 28 games. "When I see Erik Johnson wind up and then rip one into the net now, I realize even more what we were missing last season and what we accomplished without him," Blues President John Davidson said. "You don't just assume that things are going to be better, but how can they not be with us getting Erik, Paul (Kariya) and Eric (Brewer) back this season?" "I think we're going to see a fired-up Paul Kariya," added Murray. "I'm convinced, with his pride as a player, he's going to come back very determined." "The way we look at it is adding Kariya, Johnson and Brewer to your lineup is almost like gaining a few free agents," Davidson explained. "Plus, the extension of Andy McDonald's contract was a key, since he would have become a free agent." The team's only losses free agent-wise were defensemen Jay McKee and Jeff Woywitka. But, with the return of Johnson and Brewer re-joining Barret Jackman to gobble up big minutes, there is every reason to believe there will be no falloff. The key here is the experience gained last season by Roman Polak, Carlo Colaiacovo, Mike Weaver and Tyson Strachan because of injuries. Plus, Alex Pietrangelo, the Blues' first-round pick in 2008 who played in nine NHL games before returning to juniors, is brimming with confidence and looks the part of an NHL player this time around. And in case Brewer is not ready to play at the start of the season, Brendan Bell was brought in from Ottawa for insurance. Up front, the Blues had 33 goals from Brad Boyes (down from 43 in 2008-09), 31 by Backes, 25 by Keith Tkachuk and 21 by rookie Patrik Berglund. It's easy to envision four or five players reaching 25 or more goals this season if veterans Kariya, McDonald, Keith Tkachuk and Boyes stay healthy and Berglund or David Perron (who had 15 goals in his second NHL season) or Oshie (who had 14 as a rookie) makes the kind of quantum leap like Backes did from 13 goals to 31. Bottom line: There are too many emerging in-the-moment youngsters in St. Louis to count out the Blues for 2009-10. Part of the Blues' success in the second half of last season can be devoted to an overall team effort, including great performances from Roman Polak, T.J. Oshie and Barret Jackman (Getty Images). Oct. 2-3, 2009 vs. Detroit in Sweden - The Blues, fresh off their first playoff trip since 2004, would like nothing better than to start the season with a couple of wins against the arch-rival Red Wings to show the hockey world they are for real. Oct. 8, 2009 vs. Atlanta - Home schedule begins against the dynamic skills of Ilya Kovalchuk and the Thrashers. Oct. 20, 2009 at Pittsburgh - Measuring-stick game for the young Blues against the defending Stanley Cup Champs. Jan. 2, 2010 vs. Chicago - Blues don't play Blackhawks on the road until Dec. 16 and at home for the first time on this night. Feb. 13, 2010 vs. Washington - It's a chance to see two-time MVP Alex Ovechkin and St. Louis fans last chance to see the Blues before a two-week Olympic break. Last year, Backes had a breakout season for the Blues with 31 goals. Berglund added 21, Perron 15 and Oshie 14 and Roman Polak was a standout defensively. The Blues love to promote their list of homegrown players. The Blues' Grade A crop of assets allowed them to trade Lee Stempniak to Toronto for two former first-round picks -- winger Alex Steen and defenseman Colaiacovo -- players who made St. Louis better. A similar trade of prospects for a big name could be in the offing with the number of prospects St. Louis has accumulated. Alex Pietrangelo -- He played in nine games with the Blues last season before returning to Niagara. Bigger, stronger and more confident after being fourth pick in 2008 Entry Draft, he has a spot on St. Louis defense this season. Lars Eller -- Shoulder surgery in April may keep him from making the Blues out of training camp, but this first-rounder (11th overall in 2007) has all the moves and instincts to be in St. Louis at some point this season after playing last two seasons against men in the Swedish Elite League. Ian Cole -- The Blues thought he could have made the NHL this season, but he chose to return to play on defense at Notre Dame. Big. Strong. Skilled offensively. He'll work at getting better one-on-one defensively and could make it to St. Louis after NCAA playoffs in March. Ben Bishop -- Management is counting on him to star in goal at the American Hockey League level in Peoria after finishing last season in St. Louis and working one-on-one with goalie coach Rick Wamsley. Philip McRae -- McRae was sent back to junior again. But not until the center/wing wowed Blues execs with his goal-scoring touch at the team's recent development camp. Jarmo Kekalainen's scouting staff has made the most of eight first-round picks and seven second-round picks in the last five years -- starting with first-rounders T.J. Oshie in 2005, followed by Erik Johnson and Patrik Berglund in 2006, Lars Eller, Ian Cole and Perron in 2007, Pietrangelo in 2008 and David Rundblad this year. Character and work ethic plus skill and upside have been the blueprint at the draft table. However, management asked Kekalainen and his staff to add a touch of size and grit in the 2009 Entry Draft. And the Blues got size galore. "Upside is still the goal," Kekalainen explained, raising his eyes every time he talked about the size of one of the team's six latest picks. "We always try to get good players and if they're big, I think that's a bonus. "We weren't trying to build a basketball team." David Rundblad -- He's 6-2, 189 pounds and the Blues think, because he's never really been on a training program, he could fill out at about 215-220 pounds in a couple of years. He's already got the offensive skills of a power-play quarterback -- being named the best defenseman at the under-18 Four Nations tournament in Russia. Kekalainen confidently said, "He's already a talented hockey player. Now, with the help of our training staff, we expect to make him a great athlete as well." Brett Ponich -- At 6-5 3/4 and growing, Blues management was pleasantly surprised at how light he was on his feet at a prospects camp in July after taking a power-skating program in Portland recently. Ponich is a candidate to be captain of the Winterhawks, where the Blues feel his skills at handling the puck will make a quantum leap from one goal and 17 assists last season. Sergei Andronov -- He's a third round late bloomer, who already went through the draft twice without being picked. He's played two years in the Russian Elite League and played on first line for Russia at World Junior Tournament. Tyler Shattock -- At 6-3, 190 pounds, he is already bigger at this point and a better skater than power forward David Backes was after the 2003 Draft. Shattuck goes to the net with abandon and loves to hit. Should get more than the 30 goals he had at Kelowna last season. David Shields -- A 6-3, 216-pound defensive defenseman whose hockey instincts and steady play were big reason for Erie's solid finish this past season. Max Tardy -- Blues Minnesota-based scout Mike Antonovich wanted this 6-foot, 168-pound skilled forward from Duluth East High School so much that he convinced management to acquire a seventh-round pick to select him. Great hands. Had 28 goals in 25 games last season.